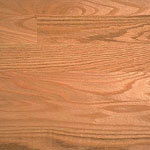 Red Oak is the most widely used wood for flooring, and there are many grades of Red Oak flooring available. This page is devoted exclusively to Plain-sawn Red Oak. Please refer to the Quarter-sawn Red Oak flooring properties page for quartered grades available. Plain-sawing involves making a series of parallel cuts through the log and is the simplest and quickest method for milling a log into planks. It also leaves the least amount of waste. Plain-sawn lumber can have a variety of appearances due to the angle of the growth rings relative to the surface of the board. As the wood dries and ages, the tension across the grain can cause the boards to cup, twist, and bow. By contrast, quarter-sawn lumber has tighter growth rings perpendicular to the face, creating a more stable board (with less tendency to swell or cup) as well as a more pleasing visual effect. Clear grade Red Oak flooring is color-sorted for a rich consistent deep pink color. Clear grade is the best flooring grade and made of the highest grade (export grade) lumber. Very little color variation is allowed in this grade. Select and Better Red Oak flooring is color-sorted to remove extreme color variation, knots, mineral streaks, and surface defects such as cracks. Slightly more color variation will be present than in the Clear grade, but it will still have mostly consistent color. Select and Better Red Oak is also referred to as Premium Red Oak. #1 Common Red Oak flooring is lightly color-sorted to remove the worst color variation. Small dime-sized knots are allowed, as well as mineral streaks. #2 Common Red Oak flooring includes all the character found in the wood. Large knots, white sapwood, worm holes, and other surface defects are included in this grade. Other common names are Rustic Red Oak, Mill Run Red Oak, and Tavern and Cabin Grade Red Oak.